1 fossil found in washington | This Blog Rules | Why go elsewhere? The first dinosaur fossil found in Washington is approximately 80 million years old. Paleontologists recently discovered the 16.7 inches long fossil that weighs around 15 pounds and have dubbed their finding UWBM 96770. 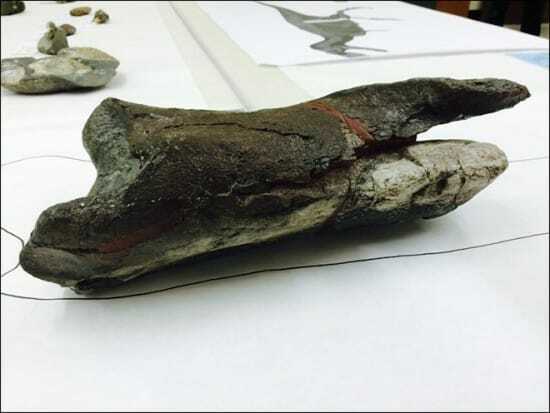 The bone is the first dinosaur relic ever found in the state. The fossil is a leg bone from a dinosaur in the T. Rex family, but smaller at around 36 feet long. You can think of a transit bus to imagine how big the animal was. The bone is definitely a rarity in Washington and it goes back 80 million years in the past. Much of the land mass in Washington did not exist back in those days. The land was mostly submerged underwater and this is why there weren’t many land-roaming animals present back then. This is also the reason why the official state fossil is a lot younger. The Columbian mammoth was found in Western Washington and until now it was the oldest fossil to be discovered with its age of 10,000 years. The dinosaur fossil found in Washington was discovered in 2012 in April. And now, after three years, we have a big unveiling. Co-author of the paper about the discovery, Brandon Peecock, a graduate student at the University of Washington said that this is a point of civic pride for Washington as it is now the 37th state to have discovered a fossil that came from a dinosaur. And because this is how most of the times these discoveries are made, this too was done by accident. The dinosaur fossil was found along the shore in San Juans at Sucia Island State Park. The bone was discovered at the high water mark. Researchers were gathering fossils from extinct marine invertebrates that are called ammonites when they made the discovery. The fossils of ammonites look like spiral shells. While they were looking for those fossils, the scientists came upon a very unusual sight. Christian Sidor, the curator of vertebrate paleontology at the Burke Museum said they came across a slightly discolored lump and they were able to observe a spongy bone texture. He said that the bone was a lot different from the rock around it, where the fossil was embedded. It took many hours to get the fossil out of its place and they were able to extract the piece in three parts, which they later reassembled using epoxy glue. The other co-author of the paper, Sidor, said that for a long period of time they didn’t think much of the specimen. He said they believed it was impossible to identify it, other than realizing it was a big piece of bone. However, afterwards they were able to find a crucial piece of anatomy. The bone was part of a femur. The scientists were able to figure out that the bone came from a land animal and not from an aquatic one by analyzing the large scars on the bone that were done by muscles. A dinosaur would have very obvious scars on its bone as it was using a large mass of muscle for movement. The scientists concluded that the fossil discovered came from a femur that was bigger than 3 feet long. Seeing how we’re talking about a 16 inch fossil that is 80 million years old, the scenarios regarding how the bone found its way to Washington are mere guesses. The Washington state is the result of a good deal of land movement. There was an inland sea at one point that separated the continent of North America into two huge land masses. Sidor said that because the region suffered so many alterations before coming to its physical state in the present and because of other numerous geological processes, geologists have huge debates over what truly happened. Sidor said that maybe the fossil found in the region came from a dinosaur that used to live there. However, this would also mean that the area wasn’t as underwater as it was previously thought, said Sidor. He also said that maybe the fossil came from Oregon, North California or from as far as Baja, California. The latter means that the fossil would have traveled more than 2,000 miles to get to the place where it was found. Beginning Thursday, the fossil will be visible on display at the Burke Museum in Seattle, Washington.